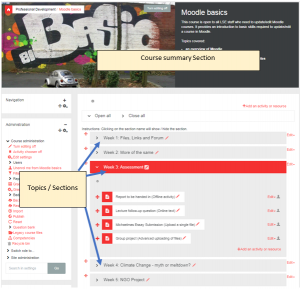 All Moodle courses have a summary section at the top followed by sections or topics, the layout of which is determined by the course format (see Select a format for your course). N.B. In the text below ‘section’ is used to refer to a section or topic. The summary will normally contain an introduction and generic information about the course e.g. contact details for teaching staff, while the individual sections contain detailed information and activities relating to the different aspects of the course. The sections can be arranged chronologically by week or by topic depending on how the course is run and the type of content and activities being hosted on Moodle. To work with the Course summary section, you will need to click on Edit settings within the administration block and scroll down to the Course summary Section. Select the cog icon below the section title e.g. Week 1 below. To add a title, untick Use default section name and add your own. To add further text, use the box below. If you want to add an image, the icon to do so may not be visible to start with – click the left most icon to reveal it. See Use the default Text editor. Text can be formatted using a range of icons from the top and bottom rows. See Use the default Text editor. See Adding content to your Moodle course for details of adding content and activities to all sections, including the summary. See Revise the section structure of your course for details of how to add, remove and reorder the sections on your course.